The devotional writings of William Law (1686-1761) have inspired evangelicals for nearly three centuries. This is his most renowned work, in which Law exposes corruption and hypocrisy in the church, and reminds believers that God not only forgives them for their disobedience, but calls them to obedience also. 350 pages, from Bridge Logos. The Pure Gold Classics series by Bridge Logos Publishers is a collection of beloved Christian classics that have endured changing civilizations, theologies, doctrines, and even changes in Christianity itself. Centuries of time and countless Christian lives have proved their value and the enduring truths that they contain of the kingdom of God and Jesus Christ. They continue to provide strong spiritual food for those who are hungry for the deep things of God. Divine wisdom and the passion of divine love. How the soul can walk securely through the darkness and the wonderful effects that are wrought in the believer as a result of the dark night. Saint John of the Cross (1542-1591) was a poet, priest, philosopher, and mystic who helped to bring about reform within the Roman Catholic Church during the sixteenth century. A member of the Carmelite Order, he worked diligently with Saint Teresa of Avila to return their order to its proper foundation, a deep devotion to Jesus Christ. As a result of their efforts, John was imprisoned. Central to Saint John's beliefs are the death of the self-life, the mortification of the flesh, and overcoming the devil, the world, and all temptations so that the soul can be completely united to God and His love. Evening by Evening contains 365 of Spurgeon's powerful and scripturally sound daily devotionals that he wrote to enlighten, encourage, inspire, strengthen, bless, change, and teach you. Combined with his 365 Morning by Morning devotionals, you will have strong spiritual food for morning and for evening - to refresh and inspire you throughout your day and your night. This selection of recorded sermons includes rare material, never before published. 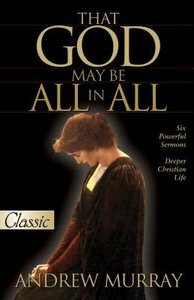 Selected, transcribed, edited sermons delivered by Tozer. BONUS: Contains "In Pursuit of God", Christianity Today Readers' Choice Award winning biography of Tozer by James L. Snyder. Viewed by his contemporaries as a preacher and writer with a prophetic edge, Tozer had a powerful effect on people. James Snyder has done a masterful job of selecting and transcribing sermons from his private collection of rare recordings, and has also captured Tozer, the man, in a biography laced with anecdotes and personal material that only a seasoned researcher could find. Contains illustrations, index, Scriptural reference.